Grasshopper's have a fast reaction time! You reach out and try to catch one, you'll find yourself empty-handed. They hop-hop-hop away! 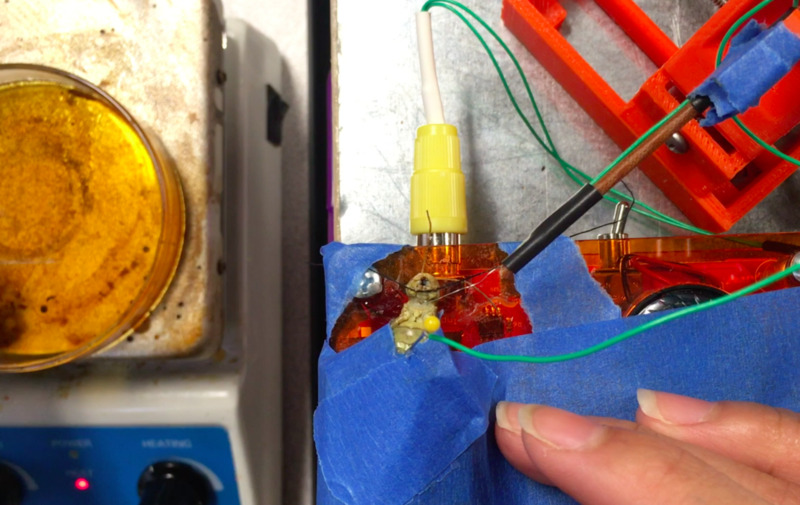 In this experiment, we will investigate the neuron's responsible for the grasshopper's quick reactions. Here you will learn about how to record from a specific neural pathway. 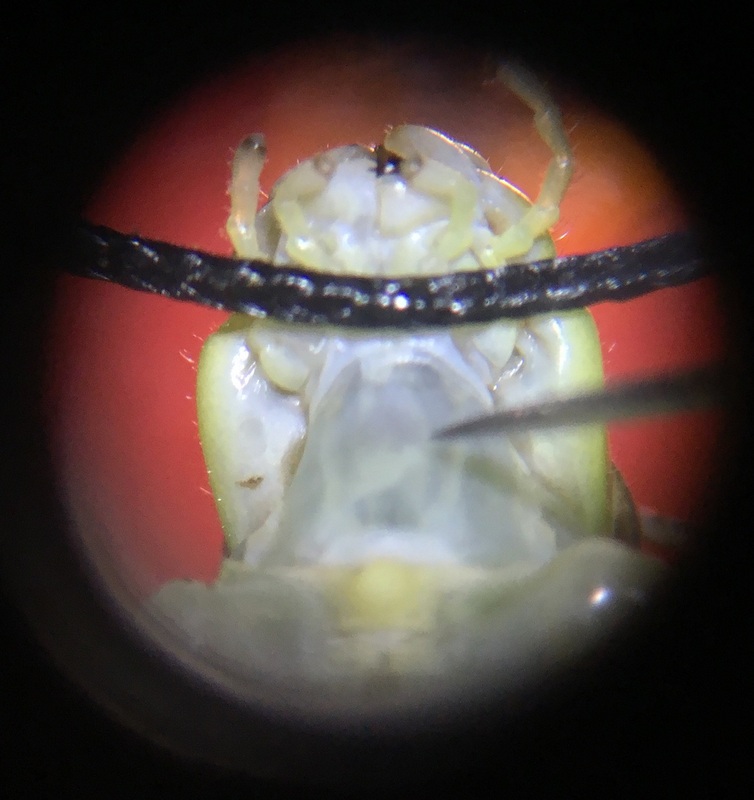 Using a grasshopper, you will record from the "Descending Contralateral Motion Detector," or DCMD, to learn about how a Grasshopper responds to visual stimuli. SpikerBox - You should become familiar with recording neurons. 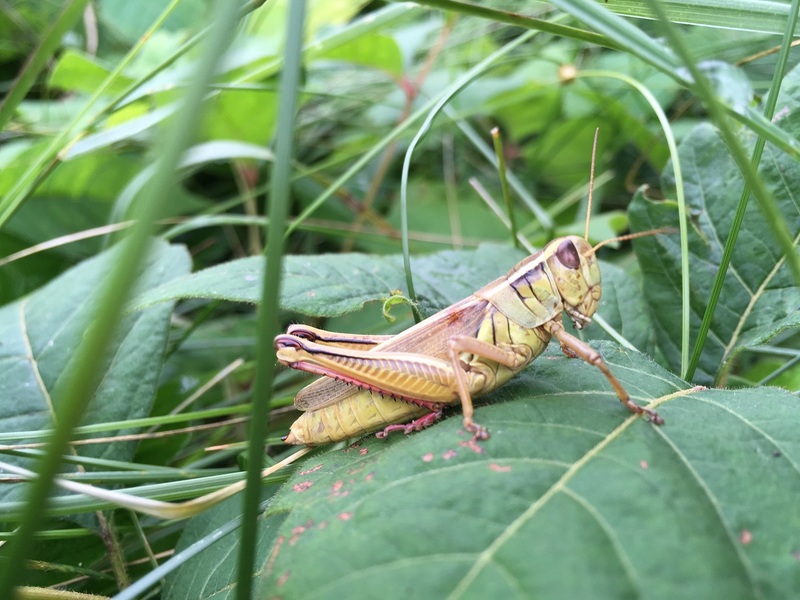 It's easy to observe that grasshoppers are able to quickly hop away to escape potential predators or quickly incoming danger, but learning just how the grasshopper can react so quickly is a research question that has interested neuroscientists for years. In 1992, researchers Simmons and Rind helped identify a specific neural circuit in the grasshopper that is responsible for reacting to movement, called the descending contralateral movement detector (DCMD). Certain movement patterns activate the grasshopper's DCMD, sending an alert down to its legs telling it to jump away. The DCMD underlies the grasshoppers' ability to visually detect, discriminate, and react to an approaching object. Grasshoppers belong to the kingdom Animalia, phylum Arthropoda, class Insecta- the largest and most biodiverse group of animals on Earth- and order Orthoptera. Their bodies are characteristically segmented, divided into three regions- the head, thorax, and abdomen. A pair of antenna on their head, for chemically sensing the world. Two dark, brown eyes (and microscopic "simple eyes" between the main eyes). Their mouthparts are adapted for chewing plants in the field or the garden (they are the "bad bugs" to gardeners). They have two pairs of wings (forewings and hindwings) and three pairs of legs- the first two pairs are for walking, and the last big pair is for jumping. 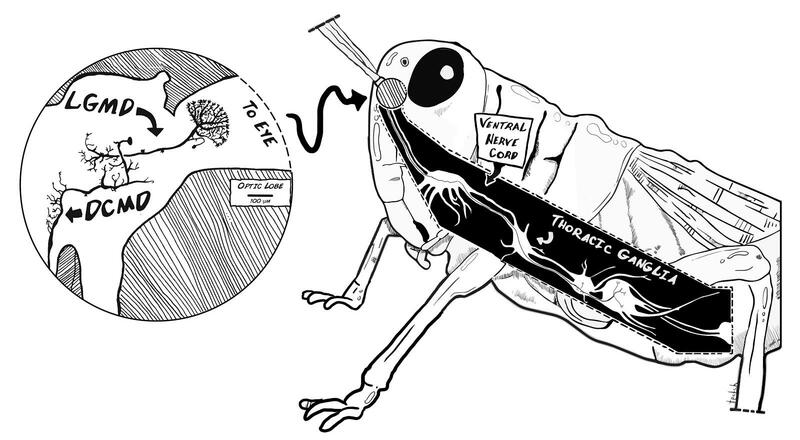 The optic lobe of the grasshopper lies in the "central brain" near the eyes and processes visual signals. This is where a type of detector neurons reside: the lobulla giant motion detectors (LGMD). 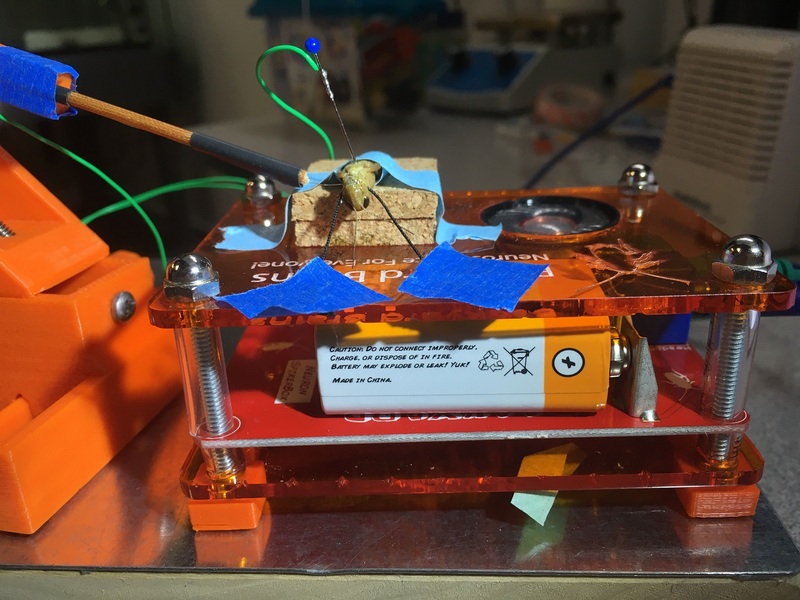 The LGMDs communicate and send the neural signals to the nearby descending contralateral motion detectors (DCMD), the neurons that run from the eyes to the legs of the grasshopper and whose activity we aim to record and analyze. 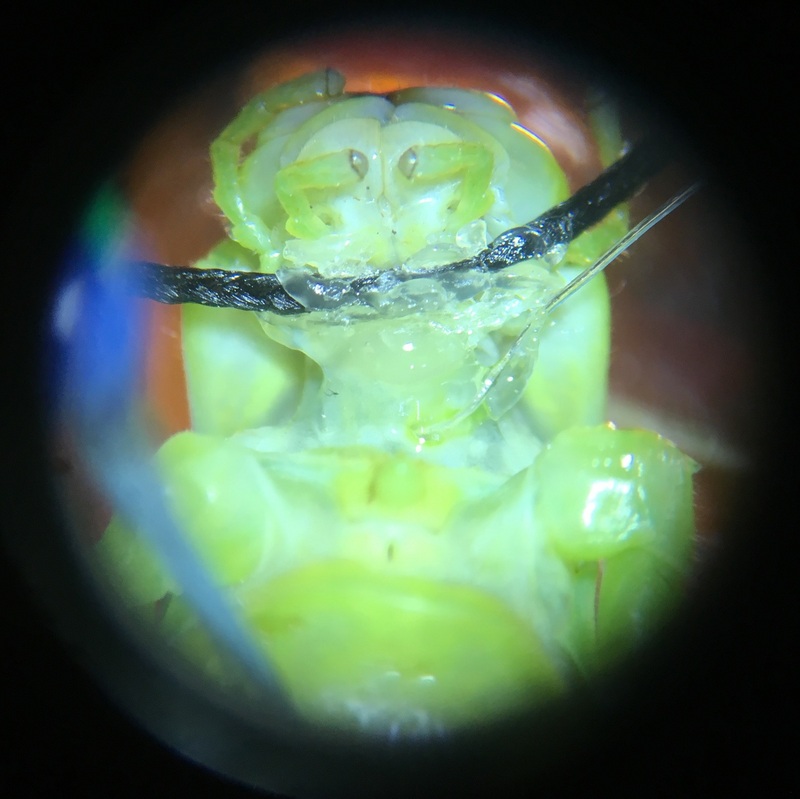 To better know the location of the nerve cords in the grasshopper, see below the exposed ventral nerve cords - two translucent tubes - between the head and the ganglia in the thorax. The DCMDs receives input from the optic lobe and output here in the thoracic ganglia interconnected by the VNC. This is where we can take extracellular recordings of the DCMDs. Also, this experiment has been published! Check out the full publication in JUNE (Journal of Undergraduate Neuroscience Education) here! 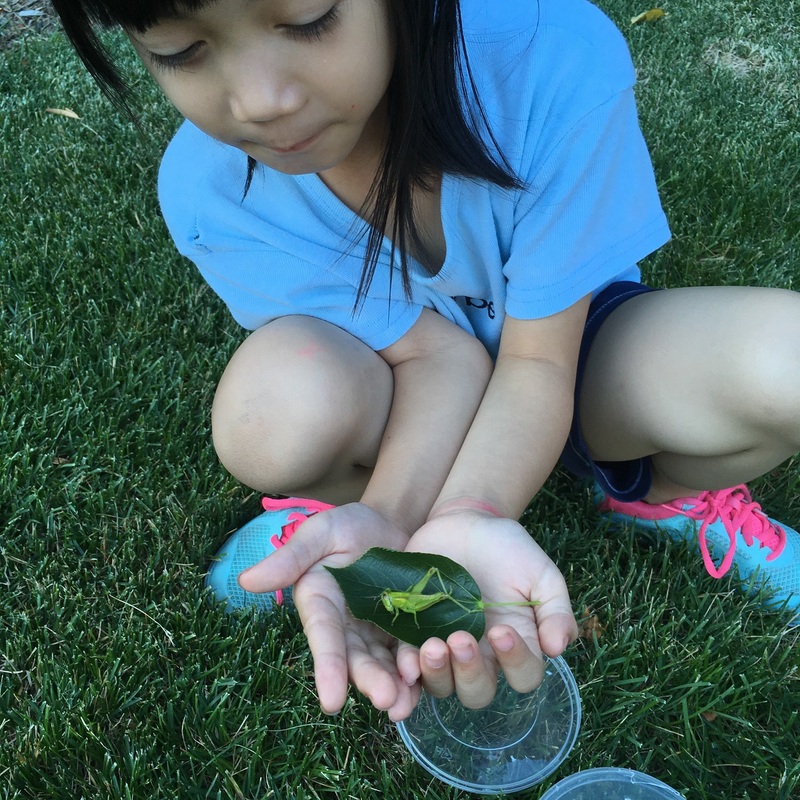 Grasshoppers can be found outside! This can be a fun way to introduce yourself to the project and to the grasshopper's escape behavior...We recommend large butterfly nets. If you're crunched for time, grasshoppers are available at any pet store as a "feeder" insect. 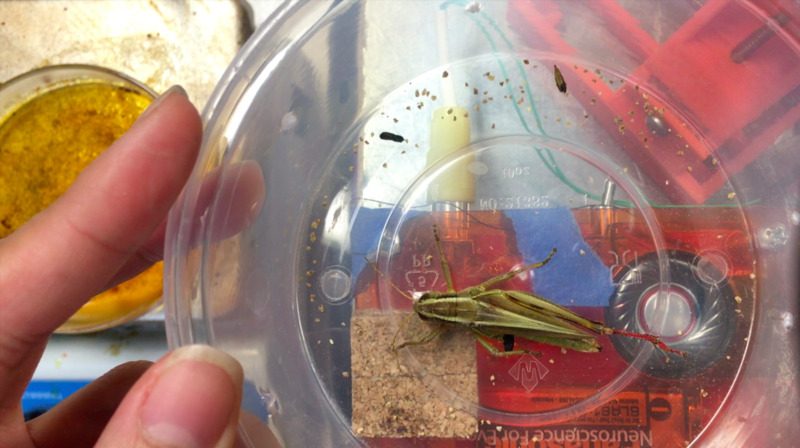 Size doesn't particularly matter for your data, but for your first few preps you might have an easier time restraining and recording from a larger grasshopper. 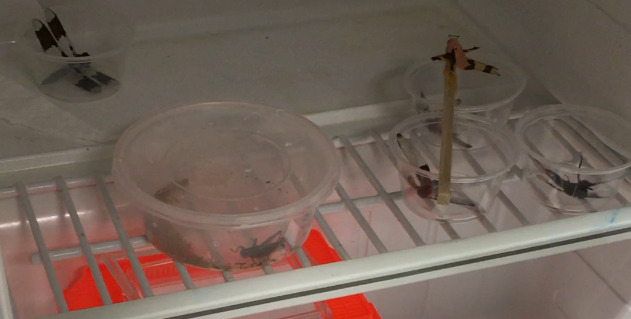 Anesthetize the grasshopper by placing it in a plastic container placing in the fridge (not freezer) for 15-20 minutes or until it is inactive. This keeps the animal still by slowing down the rate at which it fires its neurons. Evidence suggests that insects don't feel pain, but if they do, this anesthetization would also make this a painless surgery. Then, use a piece of black thread to pull the head back until the neck connectives (two white strips under the neck skin) are visible. You also need to decide here which eye you will record from. Be sure nothing will be blocking the grasshopper's vision from the chosen eye. We'll later record from the neck connective opposite this eye. This step is tricky, so be patient. 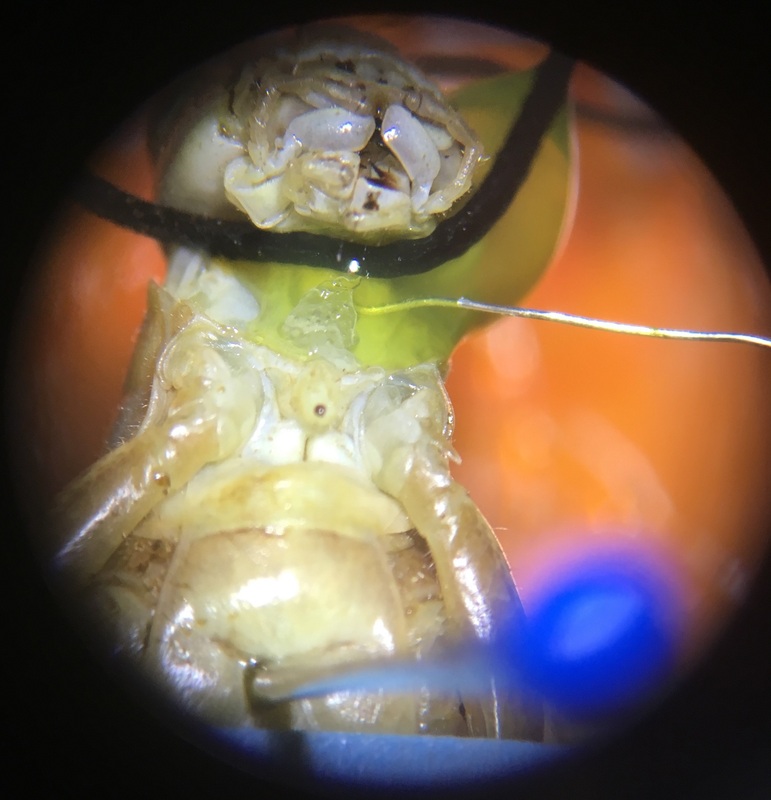 In the picture below, we plan to put the recording hook electrode around the left neck connective of the grasshopper, see where the needle is pointing in the photo (Left/Right orientation from the grasshopper's perspective as it lies on its back). So the right side and eye of the grasshopper (our left) must not be blocked by anything. This step could be optional if you do a great job securing the thread tightly, but we find it is far less likely to come undone when the rosin/beeswax mix is applied. To secure the restraint, create a 50/50 mixture of rosin and beeswax in a glass petri dish. 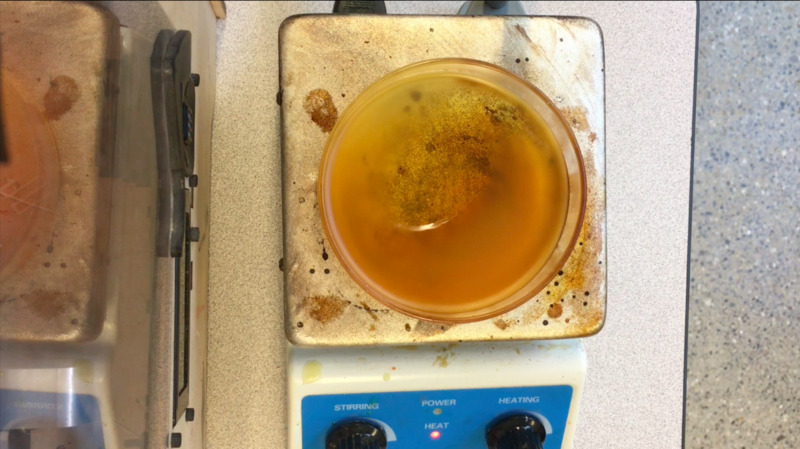 Put the dish on the magnetic stirrer, on very low heat. After a few minutes, the solid mixture is melted into a liquid. This step could be optional if you do a great job securing the thread tightly, but we find it is far less likely to come undone when the rosin/beeswax mix is applied. Now, another tricky step. Place the hook silver wire electrode around the neck connective to pick up the activity of the DCMD neurons. The BYB manipulator electrode comes as a simple straight wire. 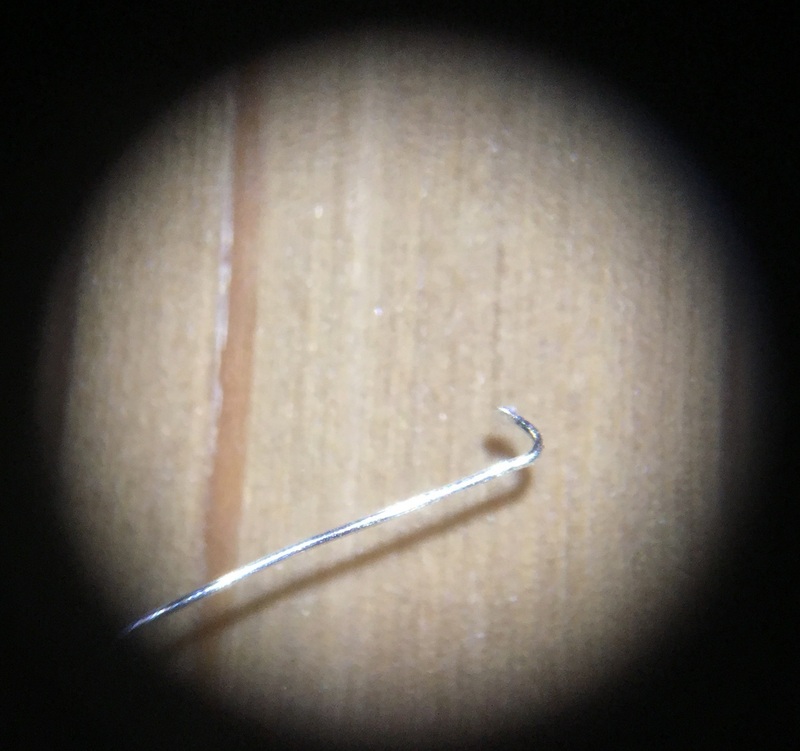 For this experiment, I modify it by using tweezers to bend the tip into a small hook, to place around the connective. 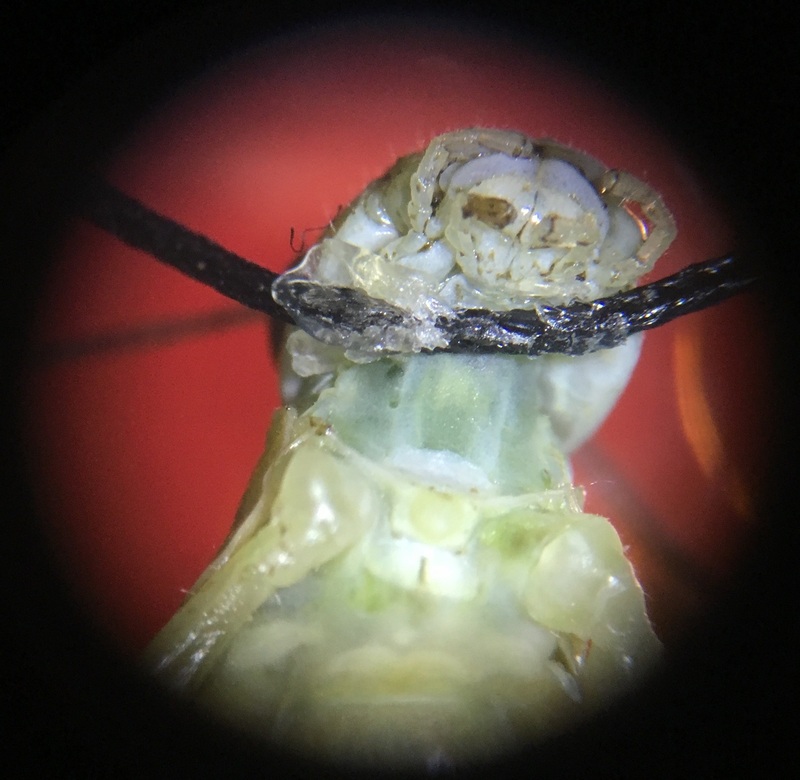 Then, under the microscope, use a tiny needle to pierce a hole on the left side of the grasshopper's neck, next to the connective. 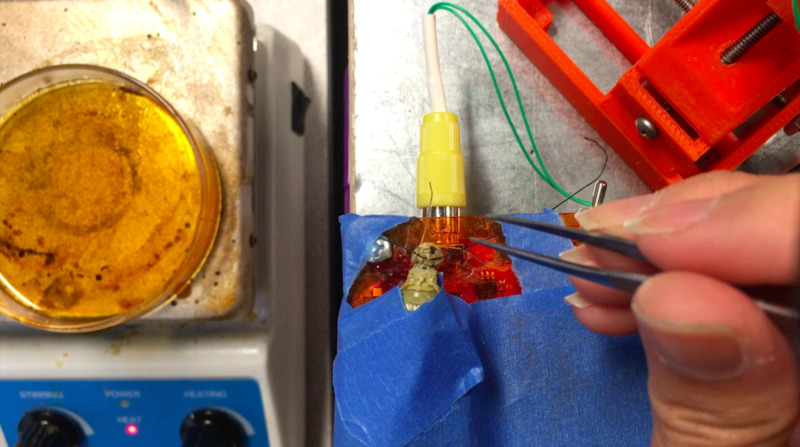 Then, carefully place the hook electrode into the hole and use the BYB Micromanipulator to adjust so the electrode is deep enough to hook around the connective. Next, insert the grounding pin into the thorax of the grasshopper. We recommend grounding slightly off center in the thorax. Also, depending on the grasshopper and the spot in the neck or thorax where the holes are made, there might be green blood oozing out (bottom photo). If there is no blood coming out, immediately put a drop of Vaseline on the recording electrode and nerve cords to isolate them from the rest of the body and keep the pierced hole from drying out (which would otherwise happen within minutes). Connect the BYB manipulator electrodes to the SpikerBox. Test to see if it works! Try pulling a piece of paper in and out of the grasshopper's line of sight. Do you see spikes? 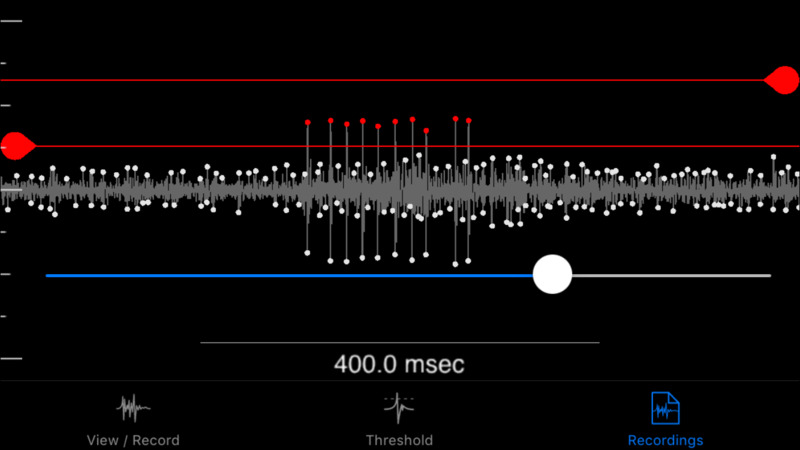 On the iPad SpikeRecorder app, set the parameters for a new experiment. 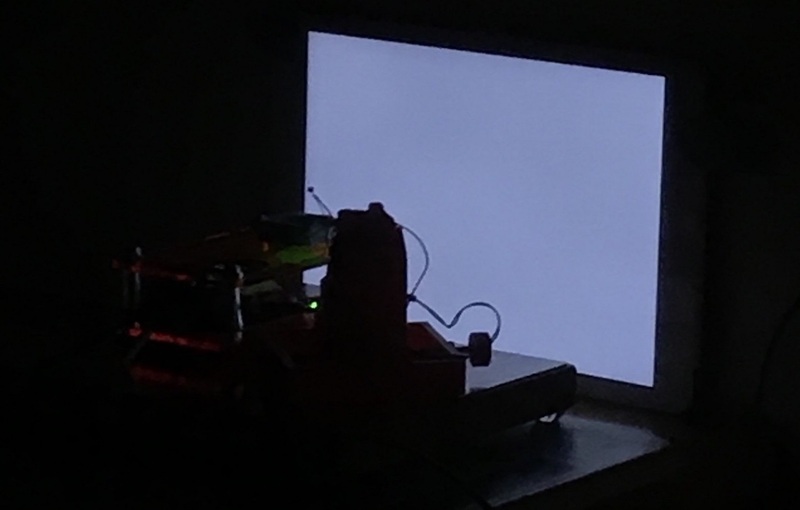 Here, I am testing the response of the DCMD neurons to an approaching black ball on a white screen. The balls of different sizes will approach the grasshopper's eye at different speeds. 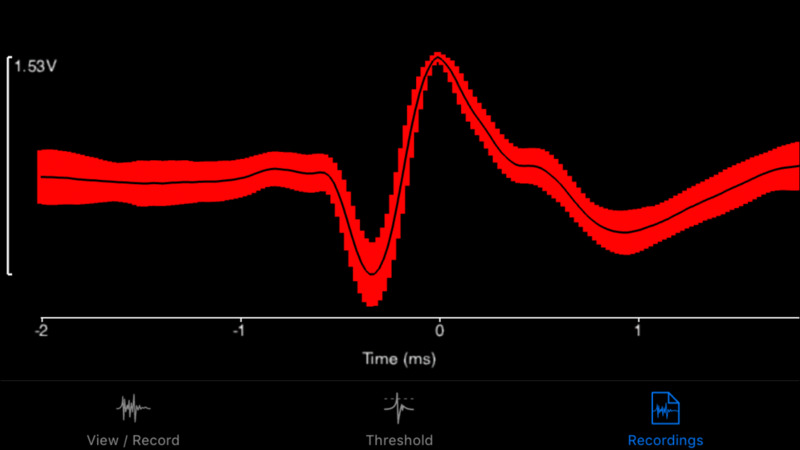 Between each trial (each trial is a pair of an approach velocity and an object size) is an intertrial interval of 45 seconds for the neuron to fire again. This delay is based on literature and personal experience, but it represents an opportunity for your own experiment! 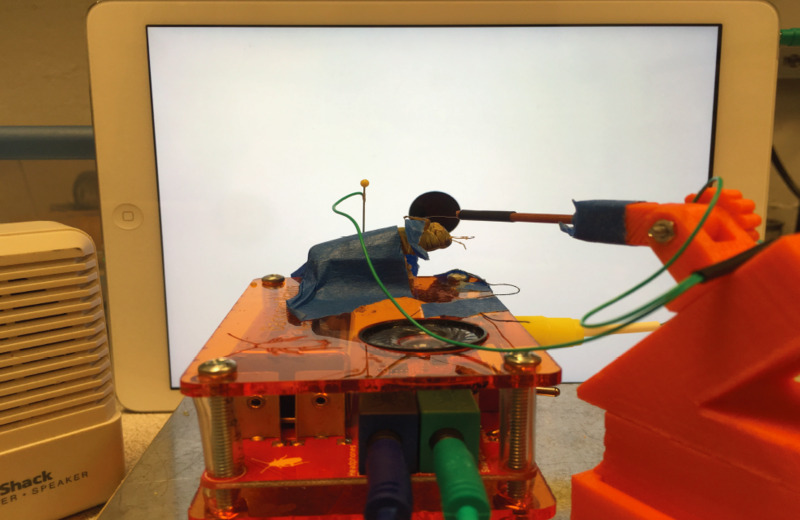 The black balls originate from the center of the iPad screen and fill up the screen to simulate approach and collision with the grasshopper's eye. After the iPad is ready, tape it upright to the wall so the angle between the center of the screen/ball and the center of the grasshopper's eye is minimal. Use a level and ruler to measure. 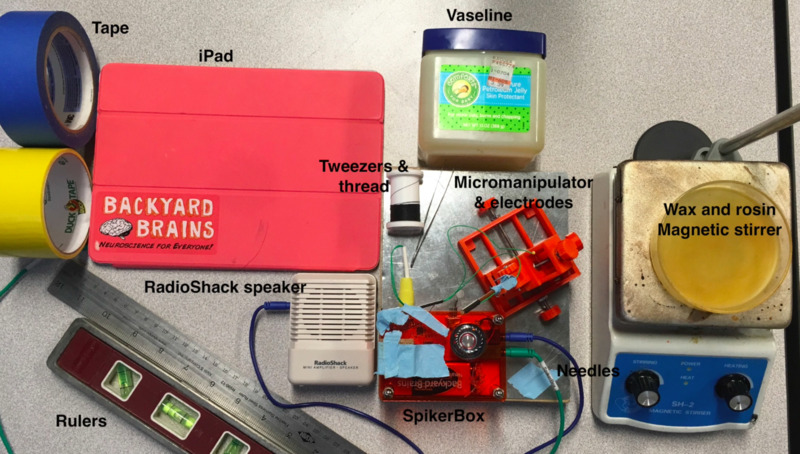 Then, connect the iPad to the SpikerBox (green cable) and also connect a RadioShack mini speaker to the SpikerBox (blue cable) to hear the spikes. Then, turn off the lights and close the doors to the experimental room for good contrast of the black ball on the white screen. Or, make a portable experimental room! 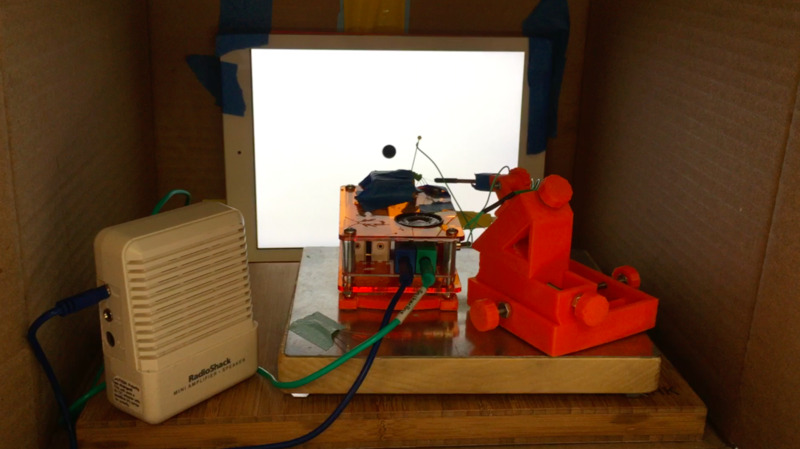 We used a cardboard box from the recycling bin of a nearby restaurant... Set up the experiment on the iPad, close the flaps, and the ball begins to come at the grasshopper's eye, activating the grasshopper's DCMD neuron, and resulting in experimental data! Note: You might know that electrophysiology recording is troubled by lots of noise, including body and other electronic sources. Choose a spot without many electronics being used, and minimize body movement. I stay at least 5 feet away and sit as still as possible while the experiment is going on. Once you've recorded data, you must first isolate your spikes from the electrical noise. After sorting your spikes, you can see the average waveform when you look in the threshold window! You can also view your data as a perievent time histogram (PETH) which gives you information about information density over time. More on this below. Finally, when your experiment is over, thank the grasshopper. If performed carefully, this procedure should not permanently damage or harm the grasshopper. Unhook the electrodes, free it from the cork board, and bring it back to the field where it can feel most at home. Now that you're recording from the grasshopper, it is time to perform an experiment! 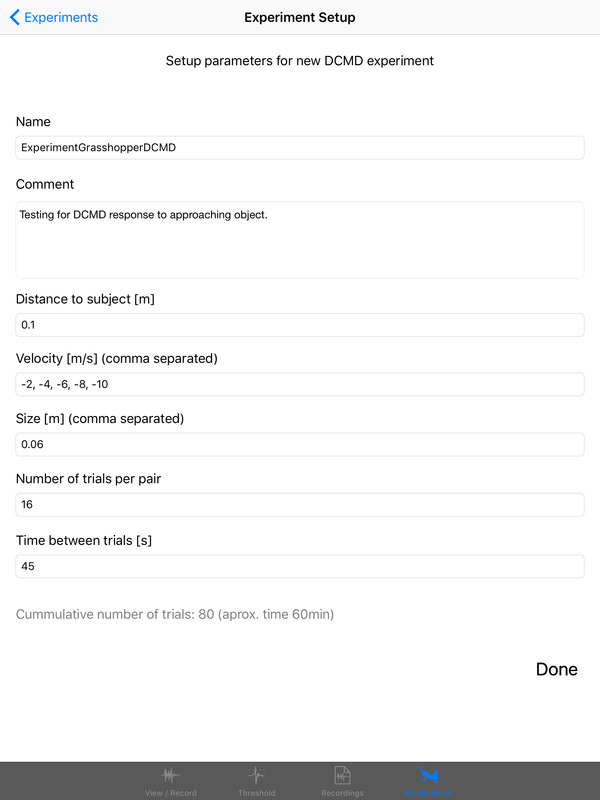 This "Inter Trial Interval" experiment will investigate how frequently the grasshopper's DCMD will fire in response to the looming stimuli presented on the iPad. Prepare your grasshopper as described in the above methodology. In the SpikeRecorder App settings, modify the "Time Between Trials" setting. We recommend 45s in the experiment, but let's test it 10s first. With the "Time Between Trials" setting set to 10s, start a 100 second timer and begin recording! 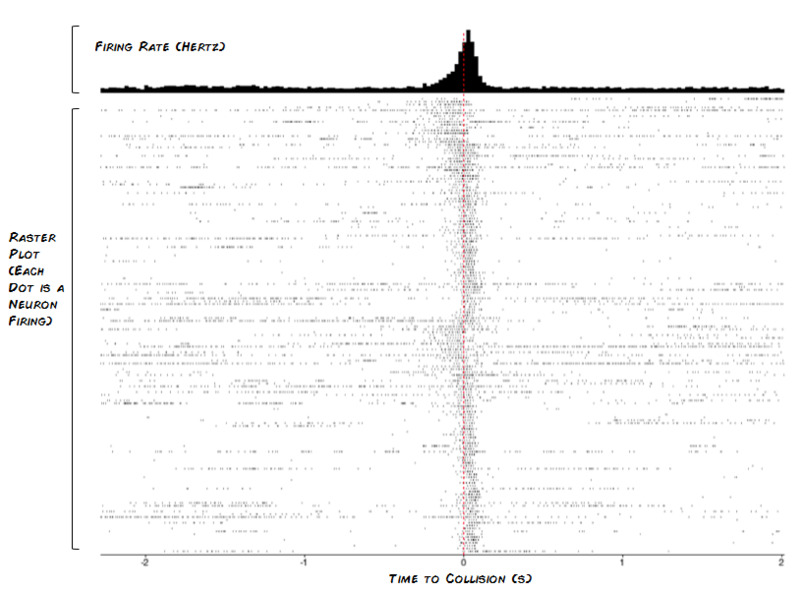 Look back over your data... You can analyze it in SpikeRecorderhow to see a perievent time histogram. How frequently did the grasshopper respond to the stimuli? How strong was the stimulus? Try changing the ITI... 20s, 30, 40s, 50s, record your data and begin narrowing down the minimum ITI for a strong stimulus response. What is this knowledge good for? Once we know the minimum ITI, we can better perform future experiments! Using the same methodology, we can record from the grasshopper's DCMD and gain a better understanding of when, and with what intensity, the DCMD fires. 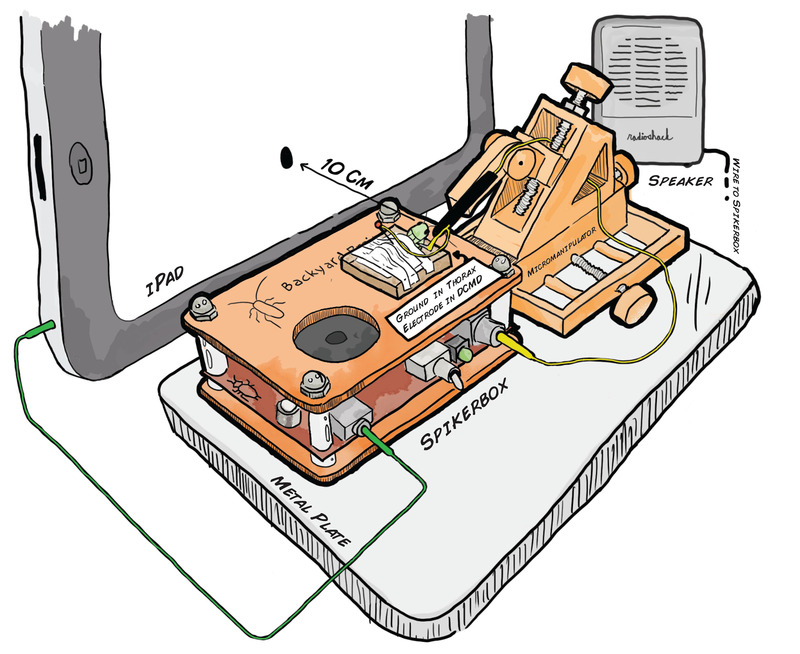 If you are not short on time, we recommend setting up an experiment that will run for two hours with a 45s ITI. This will run around 160 trials, giving you a lot of data to analyze within the SpikeRecorder. Begin with the prep methodology listed above. Go into the App settings in the SpikeRecorder. We'll be experimenting with the Velocity first, so set your velocity values to "-2, -4, -6, -8, -10" and keep your Size value (S) set to ".06". Set your ITI to 45s and your number of trials to 160. Start recording and begin the experiment! What kind of experiments can you come up with? We have one more experiment detailed in our publication, but there is no lack of experimental opportunity with this prep. Perhaps you can perform the experiment with different kinds of dragonflies! Experiment with which eye you record from. Temperature... Caffeine... Nicotine... What other stimuli could you use besides the iPad app?Let us know what you discover!